SEATTLE--(BUSINESS WIRE)--Switch, Inc., a Seattle-based financial technology company, announced today it has launched its proprietary Application Program Interface (API), “CardSavr,” the first of its kind to empower all card issuers with the ability to ensure new and reissued cards are placed into circulation, on thousands of e-commerce sites, immediately after activation. Following positive response from early adopters, strategic partner feedback and identifying a lack of appreciation for cardholder burden, Switch recognized an opportunity to leverage its core technology platform into the development of its newly unveiled API. The CardSavr ROI (return on investment) model is structured specifically to increase revenue or redeem the significant revenue lost by issuers and merchants. Due to loss, theft and fraud billions of credits cards are reissued each year. The API also provides visibility to track and increase the usage of newly issued cards. The CardSavr API already supports thousands of online merchants, and by using anonymized crowdsourcing techniques coupled with its machine learning engine, the number of Switch-enabled merchant sites grows every day. CardSavr assists e-commerce sites without any need for integration by the merchants, resulting in a far greater reach for card updates than conventional methods currently employed by the card networks. 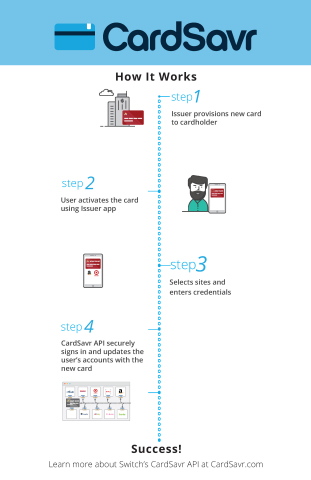 The API enables card issuers to embed Switch’s card-updating technology into their existing web and mobile banking application infrastructures with 100% control of the user experience. Switch’s CardSavr API is a standard REST API that supports basic CRUD operations for cards on file. Advanced cryptography practices are utilized that exceed the PCI requirements for transaction security and confidentiality of cardholder data. Switch CEO Chris Hopen is a technology veteran and entrepreneur who also founded Tappin, which was acquired by Globalscape in 2011. Hopen was also the Co-founder and Chief Technology Officer of Aventail, one of the first SSL VPN companies. Aventail was acquired by Sonicwall in 2007. Co-founder Dave Pool is founder of several successful technology companies, such as Spry Internet-in-a-Box and Data Channel. To learn more about Switch’s CardSavr API visit https://www.cardsavr.com/. Headquartered in Seattle, Switch creates one-of-a-kind cardholder experiences that inspire loyalty, leading to recaptured and increased card revenue. The company’s secure, proprietary and patent-pending automation technology gives cardholders the ability to manage and update all of their online accounts in one place. You can learn more about Switch at switchme.com or follow the company on Facebook and Twitter.